I wasn’t to sure what I wanted to dress up as. 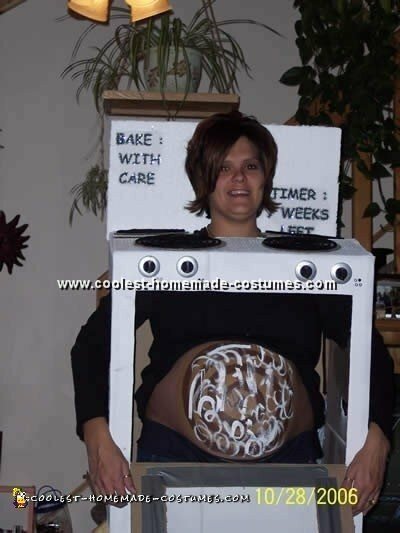 Because of my situation I didn’t have much choice except for a pregnant womens costume with a stomach showing. My sister helped me with this costume. I just found an old black shirt, painted my favorite number on the front and back, bought sweat pants to match, got high white socks and painted a stripe up the sides. wore my black shoes and put my hair in pigtails. My nephew played ball so the bat came in handy! My sister painted a baseball on my tummy and of course I wanted my soon to be son’s name on it so she put his name and #1. I was so happy with my costume I got lots of compliments! It took about 45 minutes total to put my costume together! I made the hat out of a laundry basket covered with poster board and a sash. If you look carefully you can see tiny eye holes. I wore a button down cotton sweater on my hips- filled the arms with stuffing and added gloves in place of my hands (my real arms were in the hat!). 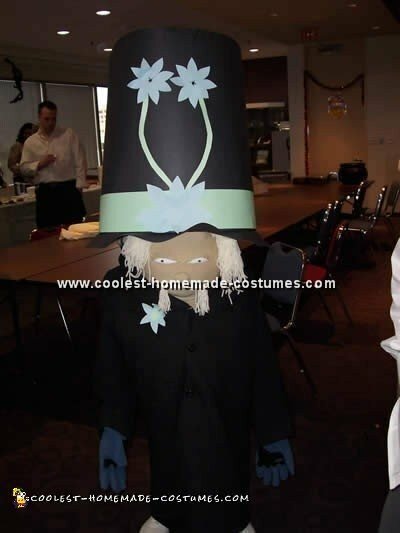 This womens costume took maybe an hour to make! My husband and I went as a shotgun wedding. We bought flannel shirts, a toy rifle and old jeans from a Good Will store so the only thing we paid anything for was the wigs. Pregnant womens costume by Angela A.
I got this womens costume idea from seeing a fat man draw on his stomach and making it whistle. I was 7 months pregnant the first time I did this costume and figured if a fat man can do it then so can a pregnant woman. What you need for this is 3 large poster boards, a man’s jacket that will fit around your hips (goodwill or thrift store is a great place to find it) yarn for the hair and either flesh colored fabric or a flesh colored tight fitting shirt. The easiest way to make it is to use the flesh colored shirt and draw a face on it. If you are not pregnant you can use a pillow under the shirt. To make the hat you take two of the poster boards and tape them together to make a cylinder. The third is cut up to make a brim and taped to the hat. Cut two holes for your eyes and disguise them with the center of a flower. Attach hair to either the hat or the shirt with tape or stapler. When you put the hat on your arms are actually folded up in front of your chest helping to hold the hat up. The jacket is buttoned around your hips. I had heavy shoulder pads in the jacket but to make shoulders you can also use 2 small balloons and tie them around your hips. Staple or attach gloves to the end of the sleeves for hands. 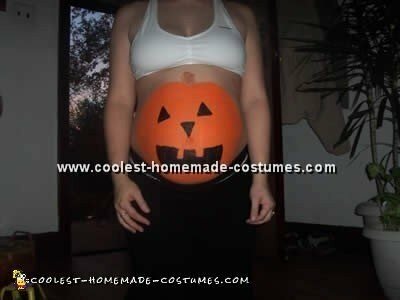 Now give your pregnant womens costume a name and you’re done. 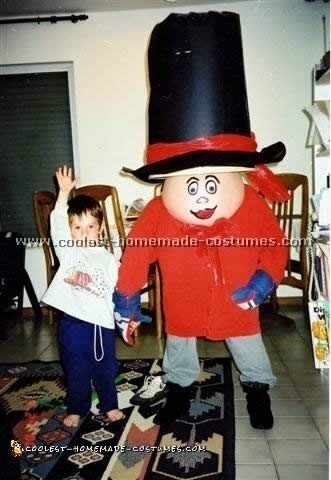 This is a fun costume to expand on just by changing the color or style of jacket or decorating the hat differently. You can also make the face a little more 3d just by finding items to replace the drawing. Because I know how to sew I made a girdle of sorts with built in pillow and sewed a face on it giving it dimension. I have also used ping pong balls cut in half and used as eyes and nose. This was a hit with co-workers and no one knew who it was. I was sitting around thinking I wanted to do something special this year with my boys before our new baby arrives. Then I thought what better way to make it special than to go trick or treating with them (I usually let dad take them out) so therefore wanted a womens costume. I wanted to do something that would make them excited about the new baby so I went out and bought some paint. So I drew the outline of the pumpkin on my belly with the help of a mirror then let the boys (6 and almost4) fill it in. I took over with the face while they went and put their costumes on. As we were trick or treating I didn’t think anyone was paying much attention to my belly. I had a few people looking but it wasn’t till we went to my brother-in-law’s house that I realized people couldn’t tell whether it was my belly or a t-shirt. This was a special way to connect with my boys. I know they enjoyed helping and the day after Halloween they were still lifting up my shirt to see where the pumpkin had gone. They were a little mad that I had washed off my pregnant womens costume! I got the idea from this web site. My husband and group of friends go out every Halloween (usually as a group). I was 8 months pregnant and wanted a pregnant womens costume to show that. I started with a cardboard box and spray painted it white. Then, I found some knobs from an old oven and sprayed painted them silver around the bottom for the knobs. I bought a towel rack and spray painted that also. For the “burners”, I cut out round cardboard and used pipe cleaners to create the look. I cut the “door” and used saran wrap for the window. Finally as an after thought I added the “backsplash” and wrote “BAKE WITH CARE” on one side and “TIMER: 7 WEEKS LEFT” on the other side. For my husband (who was a great sport) I bought a plain white apron and chef hat. I used felt to cut out the “THE BUN MAKER” and put silver glitter around it to make it stand out. Needless to say we were the hit of the night. Everyone loved it and it was fun to show off my belly! This was a real womens costume! I was 8 months pregnant and came up with a great way to use my big belly! A big Sumo Wrestler was just the costume! I already had a cream colored shirt so I began searching for something to wear on the bottom. A pair of Pajama pants did the trick. Then I bought a long black wig and twisted it into a high bun to wear. I had bought some inflatable beach ball frogs from Oriental Trading for a child’s party. I had two of the round little cuties left over and… INSPIRATION! at 8 1/2 months pregnant, my belly, only somewhat larger than the beach balls… well maybe half again as large as the beach balls (sigh and chuckle) appeared to be perfect Mama Frog size! I decided to get some non-toxic Halloween face paint and with the aid of a cut up painted egg carton for eyes and some construction paper legs (regular scotch tape to adhere them), I transformed my belly into the Queen of the Pond. In the picture you can see her posing in the middle. 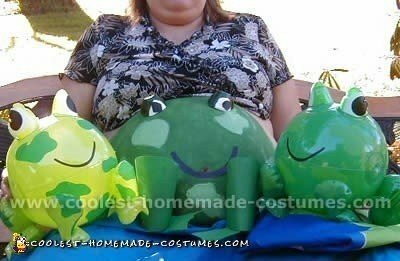 So by the time I sat the two little frog balls in my lap with my decorated belly, I had an entire frog pond in my lap (and incidentally, it felt like I was carrying an entire body of water for the whole last month of pregnancy – ha ha ha)! 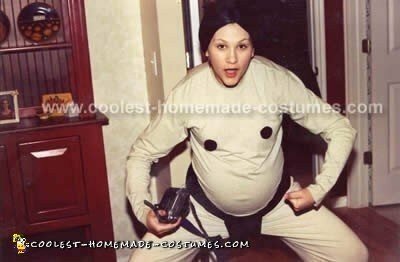 I was 8 months pregnant and wanted a costume that took advantage of that. The oven door opened to reveal the bun in the oven. If I sat down my head went down into the box allowing the tea-kettle (on my head) to sit on top of the burner. 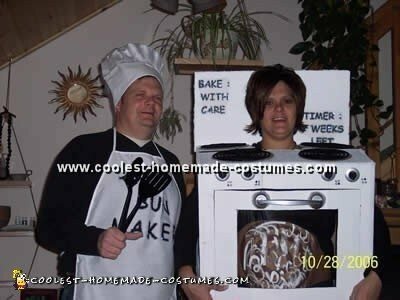 My husband was dressed as the pastry chef. We were the hit of several parties (we even won the best prize contest). It took about 3 hours to make: one u-haul box, silver foil, some knobs and buttons as well as some silver paint and of course most importantly the guts to go out in public. We had a blast and I know our little guy (born November 26th) will see this photo of my costume and have fond memories of his stay. Beer belly or pregnant belly? Well I was two weeks away from giving birth to my Son. I’m the one wearing the hat, in case you didn’t notice. 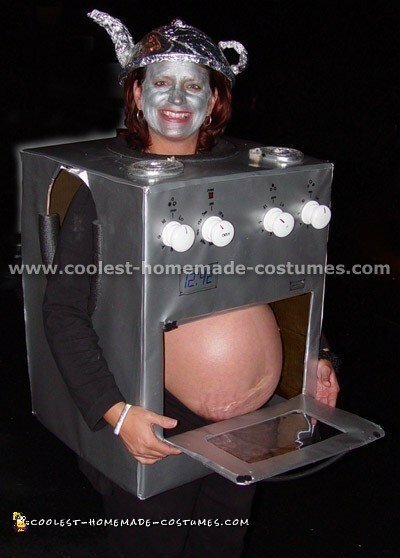 This is my first time being pregnant so I wanted this pregnant womens costume to be really unique! Where else would you be able to pull this off? 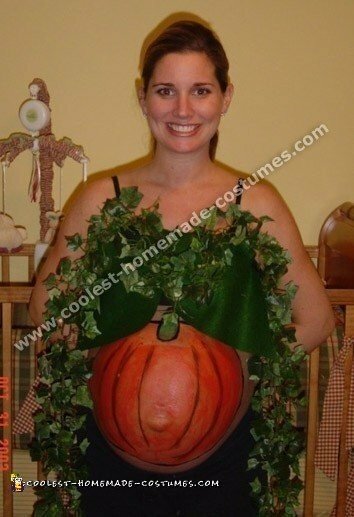 I did not want to be what every other woman who is pregnant on Halloween wants to be (a pumpkin). So I went to the local thrift store. I purchased an old pair of jeans, a white tank top, and an old hat. It just happened to be my husband’s favorite racecar driver! Then I went to a gag shop and bought a pair of fake cigarettes; one for me and one for my “old lady”. While I was there I also got a fake goatee. When I got home I somehow talked my husband into letting me shave his chest. That is where I got my chest and belly hair. I used spray on craft glue to make the hair stick to not only my chest and belly but my underarms too! yuck! It was perfect! No one knew who I was!!! The key to this pregnant womens costume was the real hair (thanks to my hubby) and you MUST get the manly walk down before leaving you’re house! FAKE cigarettes and your husband’s EMPTY beer bottle make a nice topper. It adds authenticity. Don’t forget to wear some old cowboy boots; but most importantly ….LET YOUR BELLY HANG OUT! 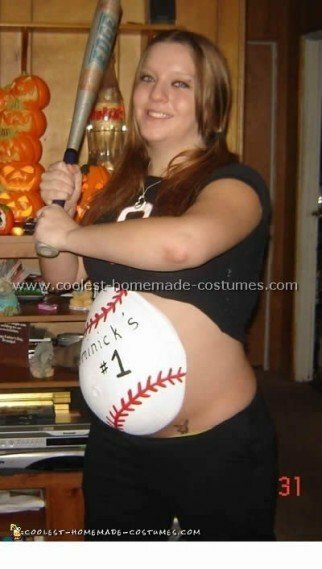 Halloween is my favorite holiday and I was at a loss when I was 8 months pregnant with no womens costume ideas. The pregnant nun womens costume or beer gut womens costume was over done and I needed something quick. Staying in season, we decided on a pumpkin! My husband hand-painted my belly with face paint from the craft store. I cut the leaves from two 8×11 sheets of green felt and hot glued them to a black sports bra. Then, I also hot glued artificial ivy to the bra and let the ends hang freely. I was a pumpkin in the patch and everyone loved it. This womens costume took less that 15 minutes to create, cost less than 10 bucks and it was a blast!